A small band of net neutrality advocates who have pitched their tents beside the U.S. Federal Communications Commission hope that their on-the-ground activism can counterbalance well-funded lobbying efforts by large broadband providers. The group of protestors, which had grown from two on May 7 to about 15 Tuesday night, is calling on the FCC to regulate broadband as a common-carrier, utility-style service, as an alternative to FCC Chairman Tom Wheeler’s recent proposal for net neutrality rules that allow broadband carriers to engage in “commercially reasonable” traffic management. 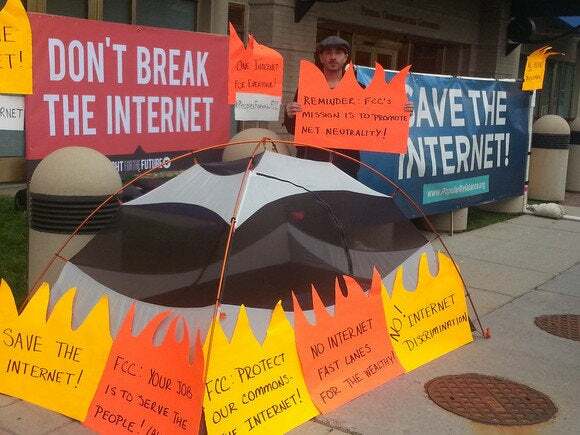 The “Occupy the FCC” protestors, in advocating for the FCC to regulate broadband in the same way as it treats traditional telecom services, are swimming upstream against several large broadband providers and dozens of members of Congress. The FCC is scheduled Thursday to vote on whether to officially release Wheeler’s proposal and open it up to public comment, and Wheeler met with the small group Wednesday morning. While Wheeler seemed to still favor his net neutrality proposal during the meeting, protestors said they believe they’re having an impact on the FCC. Three of the commission’s five members have talked with the protestors since last Friday. Momentum toward reclassifying broadband seems to be growing, added Kevin Huang, campaign manager with Fight for the Future, who came from San Francisco to join the encampment. Even though the FCC and Congress have been debating net neutrality rules for years, a January decision to throw out old FCC net neutrality rules by the U.S. Court of Appeals for the District of Columbia seems to have sparked greater public activism on net neutrality, Flowers said. The court ruling seems to suggest that, “unless Wheeler reclassifies the Internet, he’s going to have to allow Internet giants to be able to have fast lanes and slow lanes,” she added. Wheeler’s approach to enforce net neutrality rules on a case-by-case basis without reclassifying broadband is “only temporary,” and would be subject to changes by future FCC chairmen, Huang said. Last week, callers commenting on net neutrality rules overwhelmed the FCC’s phone lines, with the agency asking the public to send email messages instead. On Thursday morning, before the FCC’s 10:30 a.m. meeting, Free Press, Public Knowledge, Reddit and other groups calling for the agency to reclassify broadband are planning an additional protest outside the FCC building. The organizers said they expect hundreds of protestors at the event. As the protestors continued their vigil at the FCC, broadband providers called on the FCC to reject calls to reclassify broadband as a common-carrier service. The FCC has never regulated cable broadband providers as common carriers, Chessen added. USTelecom, another trade group, raised similar concerns in its own letter to the FCC, with CEO Walter McCormick Jr. repeating concerns that reclassification would lead to smaller investments in broadband deployment. “Nothing could be more antithetical to the [Obama] administration’s and the commission’s interests in broadband investment and deployment, job creation, and economic growth,” he wrote.